Exhaust vents are more likely than not to be in locations that are difficult to service: high up and in tight locations. Furthermore the inside portion is often covered by walls and ceilings. So it pays to install it right the first time. The following tips are specifically for air vents like those of bathroom and dryer air vents. exhaust vents for the exhaust of hot gases from water heaters and such require additional precautions. 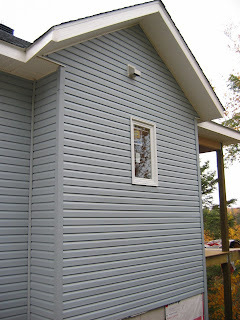 Secure it from the outside with four screws that bite into solid wood underneath the siding or other exterior finishes. Be sure to use stainless steel screws to avoid those ugly rust marks. This involves caulking on the outside and insulation on the inside. When caulking on the outside be sure to out a bead of caulk on the inside of the flange that will go against the wall, AND then caulk around the edge of the flange as well. Spray foam insulation is the easiest and best form of insulating the hole on the inside. The best insurance policy against having to prematurely replace the vent is to get one of good quality. Our next post will explore the key attributes to look for. Saving $5 only to replace the vent in a year or two just doesn't make sense.